Farming Simulator 19 will release on November 20, 2018. Confirmation came via Farming Simulator's official Twitter account, which asserts you'll be able to "farm like never before in the deepest, most complete farming simulator ever". It seems you'll need 20GB free to run it, though. While we likely won't see the recommended specs confirmed until closer to release, the minimum specs have popped up on the official forums, and were allegedly confirmed by Giants Software's community manager, Listeran, latterly on Discord. As the minimum specs are nearly twice what was required for Farming Simulator 17—and the HDD space three times as demanding—fans are now speculating on what new features may still yet to be confirmed. Farming Simulator 17's Platinum Edition added pigs, and Joe was delighted to find out they're coming to Farming Simulator 19, too. 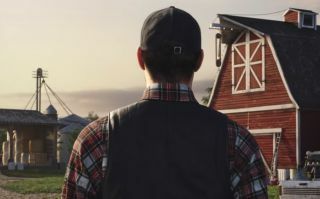 "With the addition of new brands, Farming Simulator 19's garage will feature the franchise's most extensive vehicle roster ever," the developer said. "The game will also introduce new farming activities, new animals including horses, brand new mechanics, as well as new crops—all of which we will be revealed in great detail over the coming months and future events."